1941 was a watershed year in America. War was raging in Europe. Prior to Pearl Harbor, America was embroiled in debate about entering the war. But something else was brewing seventy years ago that didn't make headlines—yet rocked the world of the young man and woman who became my parents. 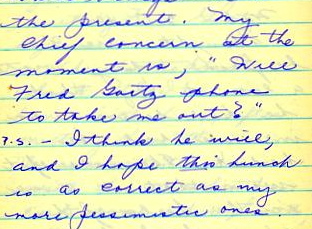 Just as I've learned about the great love between my grandparents through their century-old letters, I've once again become privy to the workings of the heart in the next generation--this time through the words of my mother recorded in her diary as she experienced the topsy-turviness of falling for a guy—hard! 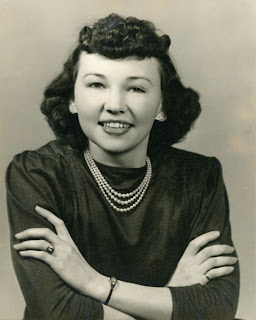 I only recently uncovered five more of my mother's diaries, and what a find they are! Lillian seems to "talk" to her diary. It's like listening to a favorite girlfriend confiding to just you about her new-found love. What fun is that! 2011 marks the 70th anniversary of these engaging, sweet, vivid entries, full of hope and promise. So I decided to celebrate this Seven Decade Anniversary by letting her words speak across the years. 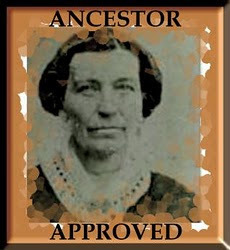 As a young woman, Mom had no dearth of boyfriends, and she seemed to be forever looking for "Mr. Right." Her entries are fresh and honest, a romantic's confidence that true love is found at last. The excitement and joy she relates as she falls deeper and deeper in love will take you for a ride you won't forget. How very quickly time does fly! As I just looked over the preceding pages, it hardly seems possible that an entire year has gone into the closed book of the past. All my problems of last year seem unimportant now. I may as well review the major events of 1940 since I last took time to write in this little book. My chief concern at the moment is, “Will Fred Gartz phone to take me out?” P.S. I think he will, and I hope this hunch is as correct as my more pessimistic ones. Will her hunch turn out correct? Tune in next time to see how it plays out.